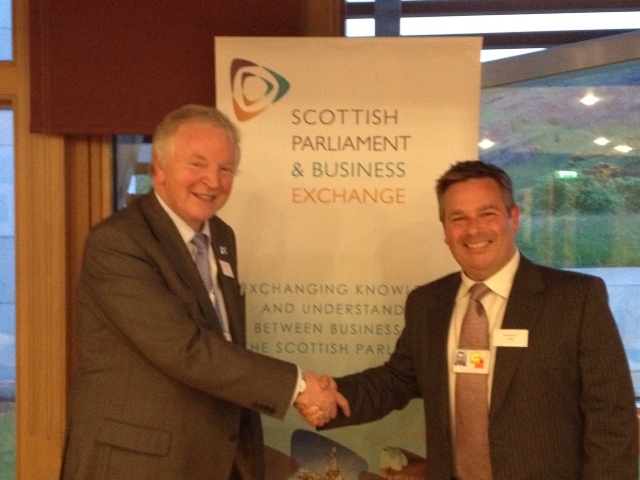 Scottish Parliament and Business Exchange (SPBE), the non-partisan organisation for fostering understanding between business and the Scottish Parliament, recently held its annual dinner. Sixteen MSPs, including Dunfermline’s Bill Walker, joined 48 business representatives in the Members’ Restaurant of the Scottish Parliament. Attending member businesses included representatives from BP, Brewin Dolphin, Brodies, IBM, ICAS, Scottish Enterprise, ScottishPower, Shell, Serco and Pfizer. The Parliament’s Deputy Presiding Officer, Elaine Smith MSP, officially welcomed the SPBE guests and spoke about the importance of MSPs engaging with businesses. After dinner, Chief Executive of the SPBE, Arthur McIvor, thanked everyone for coming and set out the SPBE’s plans for the next Parliamentary year. Dunfermline MSP Bill Walker said: “I was pleased to attend my first SPBE dinner, where I met a range of businesses operating in Scotland. The object of the evening was to increase business activity at all levels throughout Scotland by open and frank discussions of problems and opportunities.